A news report this week says that China was behind the break-in at Pelindaba in 2007 which was an effort to steal pebble bed nuclear reactor technology. The story is full of holes. Here’s why. In 2007 an effort to break-in at the Pelindaba nuclear site in South Africa went south. Two groups of four armed men each breached the significant security barriers at the site, but reportedly left empty handed after shooting an employee in the site’s emergency center. For a period of time they were reported to have had a laptop computer seized from the site in their hands, but later dropped it during the escape. None of the intruders were ever captured by authorities. The wounded employee achieved a full recovery. Now comes word from an unlikely source about what the intruders were after at the site. Early press reports published in 2007 said that they wanted to steal highly enriched uranium (HEU) which can be used to make atomic bombs. South Africa gave up its nuclear weapons program long ago, but kept the unused HEU at the Pelindaba site. It turns out, according to a news report in the Toronto, CA, Globe & Mail, for Feb 27 that the what the thieves really wanted was technology plans and specifications related to South Africa’s Pebble Bed nuclear reactor program. The revelation comes from the unauthorized release of intelligence documents from the South African government obtained and published by the Al Jazeera news network. It alleges the intruders were paid to do the deed by China in search of the so-called nuclear fuel secrets of the pebble bed modular reactor (PBMR). 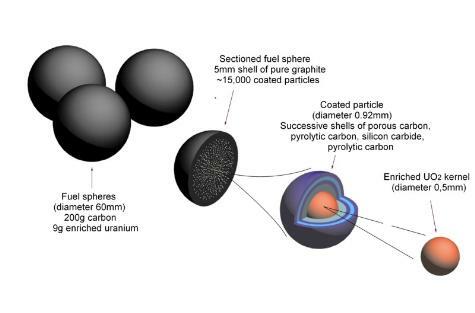 A pebble bed reactor is a fast reactor which uses uranium fuel enriched to about 9% U235 in the form of fuel elements shaped like tennis balls. A graphite coating surrounds the fuel which heats inert helium to temperatures of up to 500C. The South African government poured millions of dollars in R&D into the design, but eventually abandoned the work, but not because of issues with the fuel. However, according to the Globe & Mail report, citing the released documents, that China was behind the break-in because it wanted the pebble bed technology and stealing it was cheaper than buying it. There are a number of holes in this story leading to possible conclusions that the so-called “intelligence documents” are either fabrications or disinformation or something else, but whatever the case may be, the story doesn’t hold water. Here’s why. The South African nuclear R&D program couldn’t make the pebble bed design work. It overspent on the project to the point that the government washed its hands of the whole effort. It hadn’t solved problems, especially with regard to materials capable of handing the high temperatures, related to efficient heat transfer, and the design seemed better suited for process heat applications for industry than for power generation of electricity for general use. Even the U.S. was not impressed by South Africa’s work on the PBMR. A delegation of scientists and engineers from the Idaho National lab, led by then U.S. Energy Secretary Steven Chu, went to South Africa to see if there was anything worth saving. The idea was if there was to transfer it to the Idaho lab. Except for ongoing work on testing the pebble bed TRISO fuel, not much came out of the visit. The CBS television news program 60 Minutes went to Pelidaba in 2008 to investigate the break-in and learned nothing new about it. The CBS News report hyped the theory the thieves were trying to steal HEU. The so-called stolen computer was recovered by security teams at Pelindaba according the Miach Zenko, now an expert affiliated with the Council on Foreign Relations. In 2007 I interviewed him about the break-in shortly after his OP ED about it appeared in the Washington Post. He told me two things. First, the thieves were after the 600 kg (1300 lbs) of HEU stored there. Second, the only thing they got after a pitched, hand-to-hand battle with the employee in the emergency center, shooting him in the process, was a computer which they later dropped during their escape. It is unlikely they would have had time to copy the contents of the hard drive while running across the site in the dark. While the thieves were successful in breaching a 10,000 volt electric fence, and getting past an array of security sensors, including CCTV, they didn’t seem to know where to go once inside the perimeter. One of the two groups spent nearly an hour being lost on the site and never met up with the other. Overall, there is a disconnect between the ability of the intruders to get inside the plant and their behaviors once they got there. How the eight men involved in the break-in were going to unpack and walk way with 1300 pounds of HEU remains unexplained. In 2007 the Chinese government was well on its way toward developing their pebble bed reactor design. Plus, they were getting help from American nuclear expert Andrew Kadak who at the time was working at MIT. Kadak’s work on pebble bed reactors. His work with China precedes the Pelindaba break-in by several years. An MIT press release from 2003 highlights Kadak’s work on the technology with Tsinghua University in Beijing. The Chinese already had the technical expertise they needed so why steal it from South Africa? Spy stories, and spectacular allegations of stolen nuclear secrets, make great content for selling newspapers, or gaining eyeballs on the Internet. In this case, count me as a skeptic about the so-called truth in these reports. Postscript: My friend and colleague in nuclear blogging Rod Adams reminds me that Pebble Bed reactors are not fast reactors. This entry was posted in Nuclear and tagged PBMR, Pebble Bed, South Africa. Bookmark the permalink. What’s a more likely target for the thieves was the design details for the Afrikaaners’ uranium fission weapon design. The Chinese didn’t need that. It would have been very helpful to certain countries with large centrifuge programs. It too call the al Jazeera article (the source for the Globe and Mail) bogus, even deliberate disinformation. It is not clear that the inept SA spy service got the motive for the bungled theft right in the first place (also see article about SA spy leaks in this week’s Economist). While I agree the IP invested in the PBMR fuel might have been worth a look by competitors, there would have been easier ways to do this (e.g. just pay someone on the inside enough money). And why break into the actual site? If they knew where the target laptop was, then they probably knew who it belonged to. So in the car-jack environment of Pretoria, why not simply wait for him to exit the site? It feels like their motives were rather less crafty than supposed.